Set in the 1950s, Brooklyn stars Saoirse Ronan (The Grand Budapest Hotel) as Eilis Lacey, a young Irish woman who is excited to cross the Atlantic and start a new life in America. She says goodbye to her family and makes the journey, moving into a boarding house in Brooklyn, New York. At first, Eilis finds the city intimidating and gets extremely homesick. Eventually, however, Eilis discovers her place in New York, taking a job in a department store, going to night school to learn bookkeeping, and even meeting a young man named Tony Fiorello (Emory Cohen from The Place Beyond the Pines) with whom she falls in love. Back in Ireland, Eilis’ family tries to convince her to come home, tempting her with well-paying jobs and the love of a boy there named Jim Farrell (Ex Machina‘s Domhnall Gleeson). Eilis is torn between her new life in America and her old one in Ireland. Based on the novel of the same name by Colm Tóibín (The Blackwater Lightship), Brooklyn was written by Nick Hornby (Wild) and directed by John Crowley (Closed Circuit). Of course, it’s a period movie, full of wonderful costuming and fun music that epitomizes the American experience in the mid-twentieth century. It’s also beautifully shot, with cinematographer Yves Bélanger (Dallas Buyers Club) casting a purposefully dated pastel hue over each and every image in the film. Aesthetically, Brooklyn is a very pleasing movie. It’s also very satisfying on a story level. At its root, Brooklyn is a coming-of-age story, but it’s also a tale of independence and finding oneself. Contrary to how it might sound, it’s not too sappy of a love story. It’s definitely a character-based film, with each and every event in the film being triggered by a decision that is made by Eilis; there is nothing in the movie that “just happens.” Because of this, the story unfolds very cleanly and deliberately. There are no gun fights or explosions in Brooklyn, just the arguments that take place inside the humble heroine’s head. One of the reasons that Brooklyn is so enjoyable is that it puts a face to a fascinating period of American history; it’s an up-close and personal look at the post-WWII immigration process, where the tired, poor, huddled masses yearning to breathe free came to America from all over Europe and the rest of the world. For a period movie set over 60 years ago, Brooklyn has a surprisingly timely message for today’s political climate. But, whichever side of the civil fence you’re on, there’s no denying that Brooklyn is a fantastic movie. It’s safe to say that Brooklyn is Saoirse Ronan’s movie. Other characters come and go, but her Eilis is the focal point, the catalyst for everything that happens in the film. Ronan absolutely commands the audience’s attention, and not just by putting on a silly Irish accent and a period costume; she owns the character, getting deeply into the subtleties and nuances of the young girl’s thoughts, feelings, and behaviors. Eilis goes from timid, frightened foreigner to experienced American woman over the course of the story arc, and thanks to Saoirse Ronan’s empathetic portrayal, the viewer is right there with her the entire time. Ronan is surrounded by a capable cast of supporting actors, particularly Emory Cohen and Domhnall Gleeson in the roles of her two love interests, but the stage is undeniably hers. 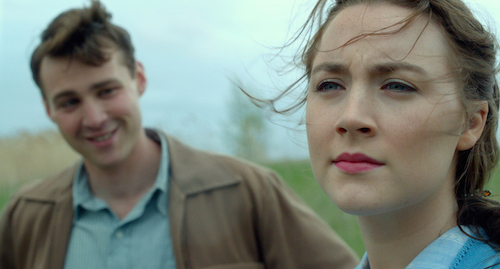 Brooklyn is the finest performance of Saoirse Ronan’s young career.